How do I install updates for Foundry? 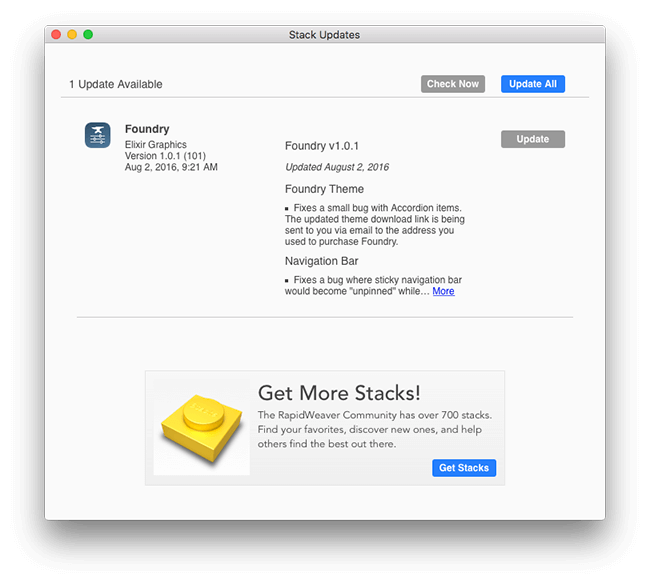 Installing updates for Foundry is quite easy. The stacks are updated through the Stacks plugin’s built-in updater and the theme can be updated through a simple drag-and-drop. Before we click that beautiful blue Update All button we want to make sure to close any projects that have any of the Foundry stacks included in them. The reason for this is that when Stacks installs updates it will download and install the files associated with Foundry, but it will also, immediately following their installation, attempt to update each Foundry stack in your open project(s). Being that there are nearly 80 different stacks and child stacks in Foundry this can take a long time if you have a project file using Foundry open. Now all we need to do is to re-open our Updates window and click the Update All button. Stacks will then download and install all of the associated Foundry files, replacing those that were already installed. Updates for the Foundry theme are done manually, as there is not a built-in updater in RapidWeaver currently for themes. When the Foundry theme is updated you will receive an email with a download link for the latest version of the Foundry theme. You can also find the latest version of the Foundry theme on the Release Notes page at any time. To install the updated theme, simply drag-and-drop the new Foundry theme onto the RapidWeaver icon in your dock. Quit and restart RapidWeaver and you’re good to go. Can I use other third-party stacks when building my site with Foundry? You can, without a doubt, use other 3rd-party stacks within Foundry. We work hard to make sure most stacks outside of Foundry will work with it. With so many third-party stacks out there though, there’s no way for us to possibly know, or list them all. If you have a question about a specific stack, be sure to post your question over on the Foundry Forum. Bricks 2 does not show up in my Stack Elements library. Bricks 2 requires Stacks 3 to work. If you’re not seeing Bricks 2 in your Stack Elements it is most likely that you’re still using Stacks 2 or earlier. Once you upgrade to Stacks 3 Bricks should show up in your Stacks Library. Bricks 2 requires specialized elements in Stacks 3’s developer API, so it will not show up in older versions of Stacks. How can I reduce the size of my images to help them load faster? There are many tool available that allow you to reduce the size of your JPEG and PNG images by compressing them. This allows your images to load faster, and in turn helps your pages to load faster. Our favorite tool for doing this is a free site call TinyPNG. It does a fantastic job of compressing your image files. One thing to keep in mind when preparing your images for the web is that your images should be 72 dpi and should be of a reasonable size when it comes to their dimensions. Try not to make your images larger than they need be. Can I use "warehoused" images with Bloom? Bloom uses a simple drag-and-drop interface for its image placement. This makes it accessible and easy to use for all levels of RapidWeaver users. Currently Bloom does not support “warehoused” images. Can I use videos in Bloom instead of images? No. Bloom is setup to use images only. It is not designed to work with videos. My content seems to be cut off in the Bloom stack. If your content is getting cut off it indicates you have too much content in the content side of the stack. The content area is the same height as the image that it resides next to. Any content that would overflow this area is hidden on purpose to make sure the two sides line up as evenly as possible. The solution would be to decrease the amount of content in the content side of the stack, reducing it until it fits fully next to the image. 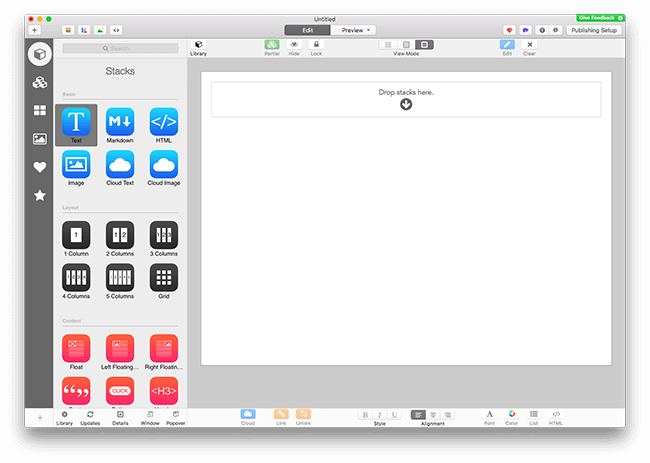 With the release of RapidWeaver 6 there is now the ability to run two version of the app side-by-side. You can now have both RapidWeaver 5 and 6 installed and running at the same time. This can sometimes lead to confusion of where a plugin, theme or even stack needs to be installed. If you’re double-clicking an addon and it’s not being installed in the version of RapidWeaver you wish it to be, give this a try: Drag and drop the stack, theme or plugin right onto the RapidWeaver icon, of the version you wish it to be installed into, in the Dock. Doing so tells that version of the app that it is the one that should be responsible for installing the addon. What browsers do the Structure stacks support? Structure’s stacks use modern CSS media queries for some of its responsive functionality. These modern techniques that are required to make things responsive require modern browsers to display them: Safari, Chrome, FireFox and Internet Explorer 9+. For more on Structure, be sure to check out its product page here. Can I hide the banner on the Tesla Pro theme? If you were to hide the banner area all of those things would also disappear from the page. We’ve built the Tesla Pro theme around this beautiful banner area, so it would be a shame to hide it. How do I install an update to a RapidWeaver theme? Updating a RapidWeaver theme is actually a super simple task. To begin you’ll need the updated theme file. When a theme is updated we will email you a link to download the latest version of the theme. If you’ve not received that email you can always get the latest version of your theme by looking up your order via our Order Lookup page. 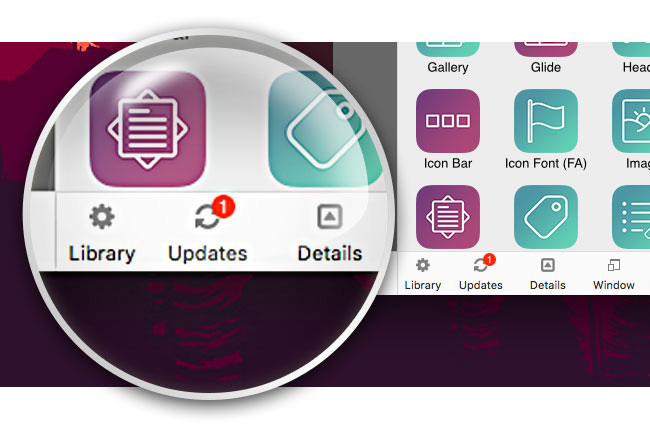 Once you’ve downloaded the latest version of your theme, updating is as easy as double-clicking the new theme file you received. RapidWeaver will take this new theme file and overwrite the old version of the theme with this new version. After RapidWeaver has installed and overwritten your old theme file you’ll need to quit and then restart the app to make sure things are all fresh and good to go. Finally you just need to publish your site using the updated theme. If you use RapidWeaver Publish method, use the “Republish All Files” feature in the File menu of RapidWeaver. This will ensure that all of the theme files are updated on your server with the new theme files. If you manually export and upload your site via your own FTP software you’ll need to Export your site as you normally would and re-upload the entirety of your site to your server. Do your themes and Stacks add-ons come with third-party plugins? Our themes and Stacks add-ons do not come with other developer’s third-party plugins. We often use plugins, such as Stacks or other third-party add-ons, to show how our products interact with these plugins. This does not indicate that they come with these extras though. The third-party plugin Stacks is required to use our Stacks add-ons. The Stacks plugin does not come with them though. You will need to get that from YourHead Software, as that is not our product to sell or distribute. What browsers does Animagic support? Animagic uses quick rendering CSS 3 animations. These animations require modern browsers to display them: Safari, Chrome, FireFox and Internet Explorer 10+. Do note though that your content will still be displayed in older versions of Internet Explorer before version 10, but will simply not animate. For more on Animagic, be sure to check out its product page here. Animagic can sometimes have its animations cropped, or cut off, depending on what stack you might place Animagic inside of. Some stacks, especially stacks like Responsive Layout stacks, need to make sure content doesn’t overflow from their bounds. Stacks like these will cause the animation to look cropped because of this. Depending on the animation though you may not even notice the crop at all. A solution though is to often put the offending stack, like in this example the Responsive Layout stack, inside the Animagic, instead of the other way around. On mobile devices we purposefully contain the animations to make sure they work properly on these mobile devices. Strictly containing them can sometimes lead to a cropped effect, but it is much less noticeable on these mobile devices because of their screen size. Since the Orbit stack is responsive you’ll likely want your images to not only scale down for when your visitors are viewing your site on mobile devices, but you’ll also want them to scale upwards to fill out the area on desktop browsers. This is done by selecting the “Unlimited” option in the Image Scaling setting in Orbit’s settings. This will cause the image to scale too fill the container it is located within in your layout. This could mean that it would scale up to the full content area’s available width, or just the width of the column you’ve put it inside of in a slide. It all depends on your layout. We offer sales from time to time, but those are infrequent. That being said, we do tend to offer discount codes when we send out a newsletter announcing a new product. If you’re interested in receiving our newsletter you can signup in the footer of the site on the main Elixir homepage. In order to use Elixir’s add ons for Stacks you will need two things: A copy of RapidWeaver from Realmac, and a copy of the main Stacks plugin for RapidWeaver from YourHead. You’ll want to make sure also that you’re using the latest version of Stacks. Each of our themes and stacks have a very detailed product page that includes all of the products information. Each product page’s Details tab outlines what the product can do, as well as any needed special instructions for using said product. We also include a Tutorials tab on some product pages that has videos that walk you through using the features of a product that are unique to itself. If you come across a question that is not answered on the product page of a theme or stack, be sure to use the search feature of the Support Page to seek out answers to any questions you might have. What is required to use Elixir's RapidWeaver themes? Elixir’s RapidWeaver themes are designed around the RapidWeaver templating system. 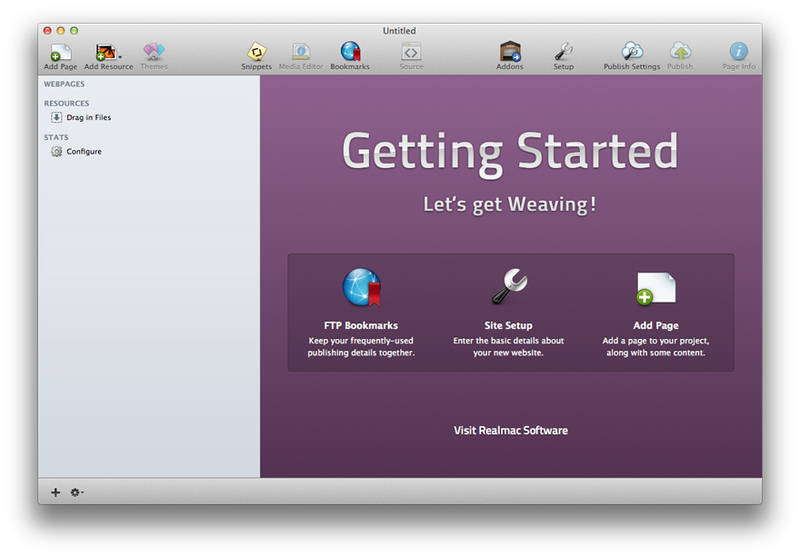 In order to use an Elixir theme for RapidWeaver you will need to purchase a copy of RapidWeaver from Realmac Software. That is the only base requirement to use an Elixir theme for RapidWeaver. You can of course expand the functionality of RapidWeaver itself with lots of plugins and whatnot (the one we do recommend the most is Stacks), but none of that stuff is required to use our themes. This not only looks much better, but will save you space and keep your site from looking cluttered and disorganized. It will also help you out if you’re using a theme that has a horizontal navigation bar. Horizontal navigations have a limited amount of space simply due to the fact that there’s only so much you can fit on one line. And if you’re using a responsive theme this can limit your space a little more, too since the navigation bar changes size as the browser’s width is reduced. Can the Revolution stack be used with a responsive theme? Revolution, which is a slider style stack, is specifically designed to work with fixed-width themes. Being that it is fixed-width it would not work well within a responsive theme. Instead you would want to checkout the Orbit stack. Orbit allows you to build both image and content sliders for your responsive based pages. Orbit allows you a lot of flexibility when designing for responsive based sites in RapidWeaver using the Stacks plugin. Can the Shelf Stack be used in a responsive theme? The Shelf Stack is a fixed width stack and is not able to be used with a responsive based theme. Due to the design of the slider and well as the graphics that make up the shelf itself, this stack is not capable of being used in a responsive environment. It works quite well with fixed width RapidWeaver themes however, allowing you to create awesome image sliders with an added lightbox effect as well. Ensure that your banner image’s filename is spelled correctly. The filename that you’re required to name your banner is listed in the Page Inspector next to the selection, as seen in this screenshot. It is extremely important that your image’s filename be spelled just as seen in the Page Inspector. Filenames are case sensitive in web browsers, so you’ll have to pay attention to the capitalization of the letters in your filenames as well. You’ll need to make sure that you’ve placed your banner image directly into the resources section inside RapidWeaver, and not within a folder inside of the resources section. When creating your images, whether in Photoshop or another similar image editing piece of software, you’ll want to ensure that your image is RGB (and not CMYK or Grayscale) and that the image’s DPI is set to 72 dpi. Web browsers often will not display images that are not saved correctly. CartLoom is a 3rd-party service we use for our digital e-commerce. They, along with PayPal, process our Credit Card and PayPal orders and deliver our digital goods to you once the transaction has completed. They’re a fabulous company and offer services for both e-commerce as well as physical goods. Be sure to check CartLoom out if you’re in need of a shopping cart solution for your site. ExtraContent is a nearly ubiquitous technology found in most modern RapidWeaver themes today. ExtraContent allows users to take their RapidWeaver site beyond the usual sidebar/content layout and add content in places otherwise out of reach for RapidWeaver-based themes. Using a special stack, or a snippet of code, you can place your content into ExtraContent areas. These ExtraContent areas are predetermined by each theme. Most of our themes provide multiple ExtraContent areas for you to use when designing your pages. You’ll find details about these specific ExtraContent areas on the themes’ product page. We usually also provide a tutorial video on the product page to walk you through where the ExtraContent areas are located in the theme. For additional instructions on how to use ExtraContent, be sure to checkout the ExtraContent site where you’ll find downloads for the ExtraContent stack, snippets and walk-thru videos. Sub-pages, or child pages, are relatively easy to create in RapidWeaver. You’ll first need to have at least two different pages created in RapidWeaver to get started. To create the sub-page you’ll want to click on and drag the page you wish to make into a sub-page onto the page you wish to make it a child of. The number of sub-pages varies depending on the theme you’re using, as does the way in which the sub-pages are displayed in the navigation. Some themes will display sub-pages as a drop down navigation, others the sub-pages will be available to your visitors only on the parent pages where the sub-page(s) reside. Are bug fixes and updates for themes and stacks free? For the most part all theme and stack updates are completely free. We provide bug updates and minor enhancements to our products free of charge throughout its lifecycle. Larger updates which would significantly impact the theme or stack’s structure might have a fee associated with them. Updates like that though are few and far in-between. So far we have yet to have a paid upgrade for any of our products. How can I modify a theme I've purchased from Elixir? When it comes to RapidWeaver themes we do not suggest modifying a theme directly. The best practice for customizing the look and feel of your pages with a theme is to use the Page Inspector’s styles tab to adjust the theme variations that come in each theme. We do not provide support for problems that arise from code modifications, whether directly to a theme or through the CSS code fields in the Page Inspector. The breadcrumb trail is a secondary form of navigation provided by RapidWeaver. It’s location within a theme can vary depending on the theme’s layout and design. 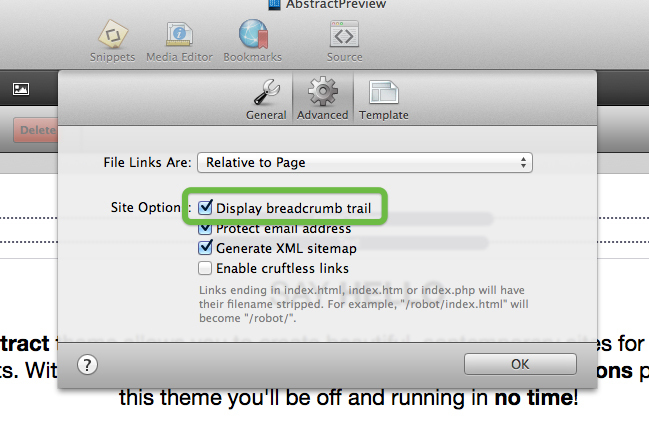 The toggle for turning the breadcrumb on site-wide is located within RapidWeaver’s Site Setup however. The toggle is found under the Advanced tab in the Site Setup. Toggling it on tells RapidWeaver to allow the theme to use the breadcrumb in its layout. Note that some themes allow you to toggle the breadcrumb on and off on a per-page-basis. The breadcrumb will still need to be enabled in the Site Setup for this to work. Adding a logo to your site in RapidWeaver is done through the app’s Site Setup panel. You can access the Site Setup panel via RapidWeaver’s menu. Go to the Site menu and choose Show Site Setup. In the General tab there is an area labeled Site Logo. The empty space below the Site Logo checkbox is called an image well. You can drag any image you like into this image well to assign it as your site’s logo. It is important to note that each individual theme may have different requirements for the dimensions you site logo needs to be, so remember to reference the theme’s product page to see if there are any specific dimensions required by the theme. Do you offer support or assistance with building sites using your themes? We also do not offer support for problems that arise from the use, or misuse, of any sort of content, code, images, etc you add into your site. Do you support, or offer help with, modifying themes? I do not offer any support for modified themes, or support to modify a theme’s internal code. As an individual I simply do not have the time and resources that this would require. In addition to not being able to help each and every customer with customizations, keeping track of each user’s custom code base would be a nightmare. Especially when it comes to theme updates — if a theme needs an update, then I would need to also create a custom update for each user with a custom theme, as to not overwrite their custom code base with the stock theme update. I do not support custom code inserted into a theme by yourself or a third-party user. Adding custom code to the contents of a theme, whether it be the main content area, the sidebar, through Stacks, etc to a theme is also included in this category. Can I port your themes to other platforms? Our themes are made for use on specific platforms and cannot be ported to other platforms without express written consent. Themes may not be redistributed, whether in their original form or an altered state. This includes porting themes to other platforms which they were not designed for. (1) Your receipt and download link(s) got swept up in your junk mail filter. Check your junk mail or spam folder to be sure that your email application did not get over zealous and sort out your purchase mistakenly. (2) You’re checking the wrong email address. Download links are sent to the email address that you have associated with your PayPal account, which is done for security reasons. Check that account and see if the email arrived there. If you still cannot find your download links it may be that PayPal just hasn’t passed off the processing information to us yet. Give it an hour or so. In the unlikely event that your email for download link still has not arrived please send us an email using our contact form. What browsers are supported by your RapidWeaver themes? We pride ourselves on being compatible with many browsers, especially the modern browsers that your visitors are using nowadays. We fully support Safari, Chrome, FireFox and Windows Internet Explorer. There are some options that work only in the more modern, standards compliant browsers. Themes that are Responsive are compatible with Safari, Chrome, FireFox, and Internet Explorer 9 and above. The technology to support responsive features, like those found in our responsive themes, is not present in Internet Explorer before version 9. Being that Internet Explorer 6, 7 and 8 are no longer supported by Microsoft, we’ve dropped support for these browser for the most part. Some of our older themes, that are non-responsive, will work in IE 8 with no problems. We have been using Internet Explorer 9, 10 and 11 in our testing and find them to be a huge leap forward for Microsoft, and we encourage all PC users to upgrade. You won’t regret it. In many ways IE 11 is a better product than FireFox even. RapidWeaver is a revolutionary, but friendly, piece of web design software made exclusively for the Mac. It will help you create and publish beautiful, modern web sites, compliant with today’s standards. For more information about RapidWeaver, please visit the Realmac Software site. We think you’ll absolutely love this piece of software. There is also a demo version of RapidWeaver available for you to download, so give it a try, and then come back and check out all of the amazing add ons we produce for this amazing app! Most likely, your CSS files did not get uploaded during the publishing of your site for whatever reason. This is an easy fix though, so there’s no need to fret. Simply use the Mark All Pages as Changed feature in the RapidWeaver File menu. 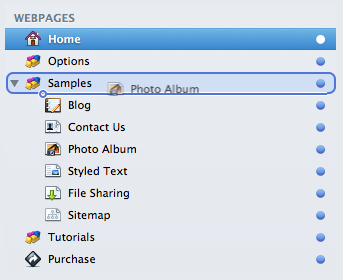 Then, from the same menu, select the Re-publish All Files menu item. This will cause RapidWeaver to republish all of the files associated with your project and force those stubborn CSS files to upload that might have been missed before. If you’ve forgotten to backup your purchased themes, stacks or icons and have lost them somehow, either through some sort of computer problems, or just an accident, fret not you can retrieve them all on your own. Simply go here to our order lookup form and supply us with the necessary information and our automated system will retrieve them for you. If you do not get results from the retrieval form it may be likely that you used a different email address to purchase your theme than the one you’re entering. Give the form another try with any alternate email addresses you may have had in the past as well. If you still cannot retrieve your purchase that you’ve lost you will need to email me with the following information: Either your PayPal receipt or your original download email. If you don’t have one of these I will need the email address that you used in purchasing your product(s) along with a listing of the particular products you purchased and are trying to retrieve. Please be sure to make backups of these files this time around, and for future purchases.